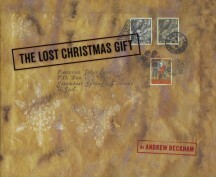 In conjunction with the recent release of his new book, The Lost Christmas Gift, Andrew Beckham will do a book-signing at Collected Works in Santa Fe. The following day, Chiaroscuro Contemporary Art will host an exhibition opening of the images and artifacts from the book. Original pages of the journal, packaging and letters will be accompanied by a selection of limited edition, mixed media works. Details listed below.